I recently read that when you go to the dentist, an almost archetypal stressful experience, your stress will be massively diminished if the dentist tells you, before picking up the drill and attacking your enamel, exactly what he or she plans to do and why. It’s a finding that can surely be safely extrapolated to many other experiences in life, and, perhaps obscurely, it reminds me of the famous story by Franz Kafka, The Trial. K is arrested one fine morning, and he doesn’t know why and he never finds out despite his best efforts, and then he’s executed (excuse the spoiler). A classic literary exploitation of the horror of stress. It reminds me also of how our co-op was treated by its government regulating body, but more of that in later posts. Kelly Lambert, a veteran stress researcher and rat-lover, describes our growing understanding of the impact of stress and how it might be avoided and treated as one of the most important developments in modern medical and health science. In The lab rat chronicles Lambert displays a pragmatic and down to earth view of stress and depression, with an emphasis on prevention and action rather than ‘treatment’ and medicalisation, which I heartily endorse, while always recognising that there are complex psychological factors that can weigh against individuals taking charge of their lives. Lambert’s intriguing rat stories serve multiple purposes, of which altering the common view of rats (as pigeons sans wings) is not the least. She teaches us, I think, that we can and have learned a great deal from experiments with animals, and especially rats, but we need to treat them with respect – and can ultimately learn a lot more from them if we do. Among the things they can teach us about are resilience, endurance, reciprocity, social capital, healthy living and self-reliance, and no kidding. But it’s the subject of stress, and building up a resistance to it, that most concerns me here. Our stress responses are of course necessary and valuable. They motivate us to save ourselves when under attack, or to perform the unpleasant task we must do as part of our job (the prospect of being sacked concentrates the mind wonderfully). Yet the negative physiological effects of stress are the same, whether you’re facing a charging elephant or an angry supervisor. So how do we maximise the motivating force of the stress response, while minimising the negative impact? How do we make ourselves more resilient? My account here will be abridged – stress is a very complex subject, and I most certainly won’t be giving a full account of it. The first thing is to be aware of stressful situations, of the type I described at the top of this post. Interestingly, the term stress as applied to humans, other animals and plants, is of very recent coinage, and it’s actually a misapplication from engineering. According to Lambert, in the 1940s, a famous researcher, Hans Selye, began injecting rats with a hormone extract to observe their responses. He noted a heap of immediate negative reactions including swollen adrenal glands, shrivelled thymus glands and stomach ulcers, and was keen to write them all up, but felt he needed more baseline data, so he tried the same experiment, this time using a saline solution to inject the rats with – a placebo, effectively. What he found was the same heap of negative responses. How could this be? It eventually dawned on him that his rough handling of the rats in order to inject them, as well as chasing the scared rats around the cage and dropping them from a height as they squirmed to get out of his hands – all of this was the cause of the adverse reactions. Selye was so intrigued by this that he ditched the hormone extracts and began running experiments to test the rats’ physiological responses to adverse events, deprivation, novel scenarios and the like. This was such a new direction in research that Selye had to find terminology from another discipline to describe the state of mind of the rats as evidenced by their physiological and hormonal responses. He found what he thought he needed in the literature of engineering, with its twin terms stress and strain, but, being a Hungarian reading in English, he appears to have misunderstood that the term stress was applied in engineering to the causal factors operating on, say, a bridge, while strain was a description of the effects of those factors on the strength and durability of the bridge. In any case, psychology had been gifted a new term, one which has been a major feature of psychology and mental and physical health research ever since. As the evidence mounted for serious negative effects on subjects exposed to events now deemed ‘stressful’, more consideration was given to variation within the findings, so as to better understand resilience in the face of stress. Work done with rats exposed to novel scenarios has shown that the responses vary on a spectrum from neophilic at one extreme to neophobic at the other. That’s to say, when placed in a new environment, the neophilic rats will be happy to explore it, while the neophobic ones will exhibit avoidance and a degree of inertness. Another way to categorise them is ‘bold’ and ‘shy’, and whereas bold and risk-taking creatures (it’s almost inevitable to think of teenage male humans) can create their own physiological problems, such as broken limbs or death by misadventure, the evidence in rats is that they live longer, on average, than their risk-averse fellows. The research also indicates that having the right temperament, or somehow building it into our natures, is key to coping with the day to day stresses that can accumulate in affecting our health in a host of ways. So how do we enhance boldness or neophilia – in just the right measure – to cope with the slings and arrows? And why is it that some rats and people are more neophilic than others? Not sure that I can provide clear answers to these questions, but let’s come back to them after looking at the rat studies. First, we’ve all heard of homeostasis, right? It has something to do with maintaining your body temperature and internal environment within certain parameters regardless of what’s going on outside. Fine, but studies of stress and responses have added a new, related term, allostasis, to the physiological lexicon. Allostasis is not so much about stability as about appropriate bodily change in response to external stimuli. For example, if you suddenly consume a heap of chocolate, as I’ve been wont to do, you’ll be hoping that your body’s insulin-producing response is timely and appropriate. Neuroscientist Bruce McEwen, adapting another engineering term, introduced the concept of allostatic load, a reference to the strain on the body when it fails to adequately cope with a stressful experience, whether it be heavy lifting or the deaths of loved ones. Both the general concept of stress and the concept of allostatic load were developed by researchers observing the responses of rats. McEwen injected rats with the stress hormone corticosterone for 3 weeks, and then looked for changes in the hippocampus, an area which contains many glucocorticoid receptors, implicated in stress-related responses. The hippocampus is a region essential for spatial learning and memory; it would stand to reason that stressors and memory need to be associated for effective response. The added corticosterone had the effect of reducing the connections and size of the neurons in the region. How did this downsizing affect memory and learning? McEwen first tried to replicate this effect on the hippocampal neurons by means of stress. So instead of corticosterone injections, he placed the rats in a ‘Plexiglas restraint tube’ for a couple of hours a day for 3 weeks. The physiological changes were similar to those induced by the hormone injections. Another stress experiment was tried by Lambert to see how quickly the brain could be affected. Rats were housed in cages with adjoining running wheels, and their food schedule was restricted to one hour of feeding a day. The rats responded by becoming more, rather than less, energetic, running frenetically and showing all the signs of stress first noted by Hans Selye – swollen or shrivelled glands and stomach ulcers – and shrinking of neurons in the hippocampus. But the shrinking of neurons in all these experiments was reversible, and Lambert considers that this shrinking is probably an energy-saving manoeuvre of the brain. Brains take up a lot of energy, and may react to increased hormone production by downsizing to prevent overload. 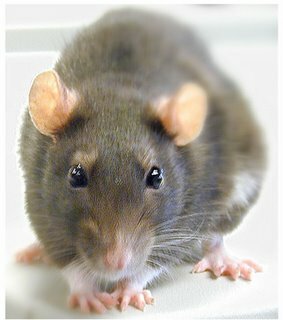 Returning to the temperamentally bold and shy rats, I’ve noted that the shy ones have shorter lives – 20% shorter on average. Not surprisingly, the bold rats’ hormones returned to base levels more quickly after stress than their shy kin (and often they were actual kin). Clearly, having a more exploratory nature, within limits, is more adaptive than being exploration-averse. Freezing and worrying over novel scenarios isn’t a healthy option. Lambert and her students became interested in pig studies in which piglets, held on their backs for a brief period, reacted either by struggling to escape or by holding still. The struggling piglets were labelled proactive and the apparently passive ones were labelled reactive, but a second test showed that some of the piglets changed tactics. Lambert’s group tried the experiment with rats. They found that some rats were extremely active, some extremely passive, and some switched tactics from one test to another. The last group was labelled as variable or flexible copers. The question was, had this group learned something between the first and second test which had made them change their behaviour? After the tests, the rats were put through an activity-stress program in which they were given a restricted feeding schedule and then were given a choice between running on a wheel or resting. The proactives and the flexible copers ran more than the reactives. The levels of stress hormone were measured in each group. The proactives had more elevated stress levels than the reactives, but, quite surprisingly, the flexible copers had considerably lower stress levels than both the other groups. In another simple test with the same rats, clips were placed on the rats’ tails to see how long they would persist in trying to remove them. The flexible copers persisted longest, and generally interacted more with novel stimuli. The rats were then tested for how they coped with more chronic and unpredictable stress, of the kind that might be compared with serious economic downturns as experienced in the US recently, not to mention Greece, Ireland and other countries. The rat equivalents were strobe lighting, tilted cages, vinegar in their water, and predator odours. What was found with these and other tests was that the flexible copers’ brains produced higher levels of neuropeptide Y (NPY), a neurochemical associated with resilience (special forces soldiers produce a lot of it). The flexible copers also had the highest levels of corticosterone, which assisted them in maintaining a constant state of readiness to meet changing challenges. So, how to turn rats – and people – into more resilient, flexible copers? Perhaps a bit of training might be required. An experiment was conducted in which the profiled rats were assigned to two groups, a ‘contingent training’ group, in which reward was contingent on effort, and a control ‘noncontingent training’ group, the trust fund rats. It was expected, or hoped, that the passive and more stressfully active rats in the contingent training group would, feeling an enhanced sense of control over their environment, increase their NPY levels and generally behave in more resilient ways. The contingently-trained rats, regardless of their coping profiles, all performed better at trying to get rewards (froot loops!) out from inside a cat toy (the task was impossible, but they were being tested on persistence). So far so good. Next, the rats were asked to perform a swim test, which I won’t describe here, but the results were excellent for the flexible copers, who improved their performances even more (and had higher levels of the hormone DHEA, associated with resilience), but the other two profile groups didn’t improve. A disappointing but not entirely surprising result. Instead of having no effect on the coping responses, the trust fund condition erased the advantage typically shown by the flexible copers. The lack of a predictable contingency formula accompanying the presentation of life’s sweetest rewards reset the behavioural computations underlying the rats’ motivation to work for their rewards. They were now characterised by less flexibility in their responses and a shorter tolerance for work that didn’t immediately produce a reward. Had we systematically spoiled our rats? Once again, animals that were more sensitive to associations between effort and consequences would likely be even more affected by the trust fund noncontingency condition; after the fact, it all made so much sense. So what can we take from these complex but often striking findings? Of course it goes without saying that we’re not rats, but I also like to think it goes without saying that these findings are highly relevant to humans, and all other mammals. Above all we find that removing us from a state in which we have to strive for rewards tends to make us slothful, intolerant and complacent – ‘spoiled’. A term which now has added resonance. How we build in that resilience in the first place is another question – it might be that very early experiences in which we’ve made positive connections between effort and reward, strongly reinforced from time to time, make for a kind of ‘natural’ resilience which we wrongly consider innate. This has always been my suspicion, that the earliest experiences, even in the womb, can set a strong pattern, which is what we’re talking about when we note that a baby seems to have already a set character, whether timid or ebullient, from birth. That character, when it is ‘resilient’, can be spoiled, so that’s something to watch out for. And as to how a set character which is non-resilient can be transformed into a flexible coper, that’s a tougher problem, as you’d expect. What I like about Lambert’s approach is that she’s always looking for how we can improve our well-being without resort to medications, ways of positively altering our hormone regulation system through behavioural change, rather than through resort to pills. As she points, the use of anti-depressant medications has sky-rocketed since the mid-nineties, as have diagnoses of depression and related disorders. Something’s definitely wrong here. You’re not likely to increase resilience with pills. The good thing is that more and more researchers are coming to realize this, and looking to behavioural change, from exercise to social interaction to the creation of challenges and rewards, for the answers.